Greg graduated from Columbine High School in 2002. He enjoyed Columbine to the utmost – some of the best times of his life were spent at Columbine. What he enjoyed most was participating as a Columbine Rebel in the CHS football program. 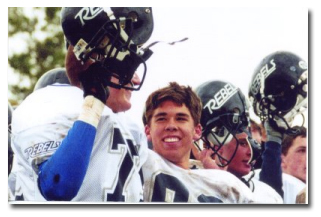 Greg played “Rebelball” (term coined to describe football at Columbine) for each of the four years he attended Columbine. To help Marines that have been injured, the family suggests donations to the Injured Marine Semper Fi Fund.